Proper maintenance of your swimming pool requires the right tools. Although there are many things you’ll need over the life of your swimming pool, the basic essentials will make owning and maintaining your pool easy and inexpensive. 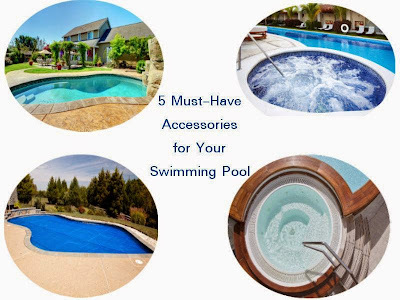 Following are 5 must-have accessories for your pool. They’ll keep your pool clean, safe, and well maintained all year round. Your filter and pump system keeps your water clean. The type of system you use will depend primarily on the size of your swimming pool. Filters remove contaminants from the water, and using the wrong size can compromise the water quality and increase health risks. The pumps help to circulate the water and prevent any changes in your chlorine level. As water is moved through the system, its chemical balance is maintained to maximize its overall quality for use. A pool cover helps keep unwanted objects from getting into the water. This helps minimize contamination from leaves, animals, or dirt. It also provides a level of safety by preventing any accidents with young children or pets. Covers minimize the amount of cleaning you’ll need to do over time while reducing the workload of your filter and pump system. This can save energy and cost for you. Although a variety of covers are available, including manual and automatic, the important thing is to choose one that suits your needs and budget while keeping safety in mind. Pool vacuums are valuable for maintaining clean water. Where filters are often unable to remove debris from the bottom of swimming pools, a vacuum will get rid of it easily. Vacuums consist of a telescopic pole and vacuum head to help make it easy to clean deep pools. Manual and automatic vacuums are also available depending on your specific needs. Using the right chemicals is essential to pool maintenance. Chlorine helps to disinfect the water and remove algae that collected over the off-season. It can be added to water in a variety of forms, including sodium hypochlorite and calcium chloride. Along with chlorine, chemicals to stabilize your pool’s pH are also necessary. The pH level can affect your reaction to the water and should, therefore, be maintained at a level of approximately 7.2. Determine which types of chemicals are right for your pool. Different products can vary in concentration and should be chosen carefully.